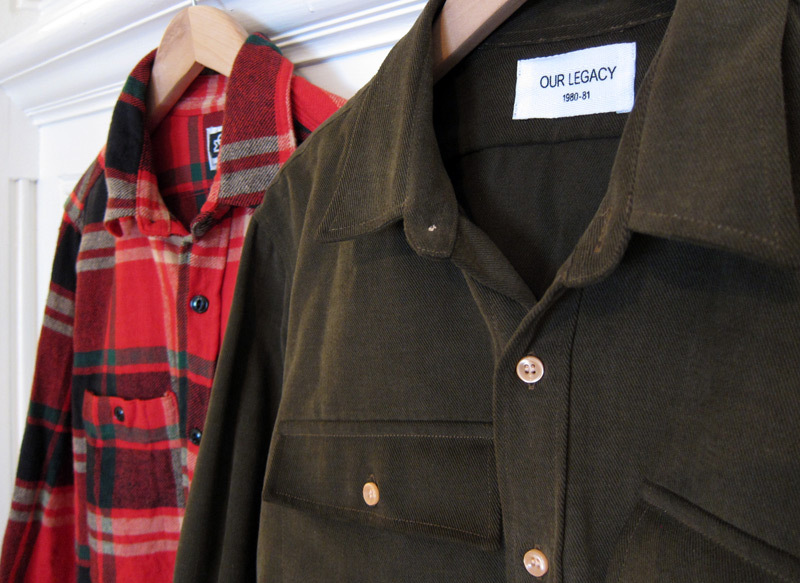 Olive is not the first color that comes to mind when picking out a shirt, but this particular one on the right from Our Legacy has been a nice alternative to a jacket this month when the weather is still on the warm side. Its design is simple and the angled flap pockets are reminiscent to older outdoor shirts, most notably from LL Bean. The most interesting part is the sueded heavy cotton twill that it’s made from giving it a very soft hand. Where to find: several online stockists are carrying this shirt in olive and navy, just search for “Our Legacy two pocket shirt”. The Engineered Garments workshirt design is available in several cotton flannel patterns this season, and the one I picked out is as close as I’ll be able to get to the colorway used in the older flannel binocular shirts (years later I still regret not getting one). While it can be a bit too bold to wear on its own, it will be perfect for layering under other casual items like a corduroy Bedford and ripstop field vest. Where to find: a good variety of flannel workshirts are available through Blake, Drinkwater’s, and Inventory.